« Saturday: Rainy or Sunny for You? I hope you were among the many who watched the NBC mini-series A.D. 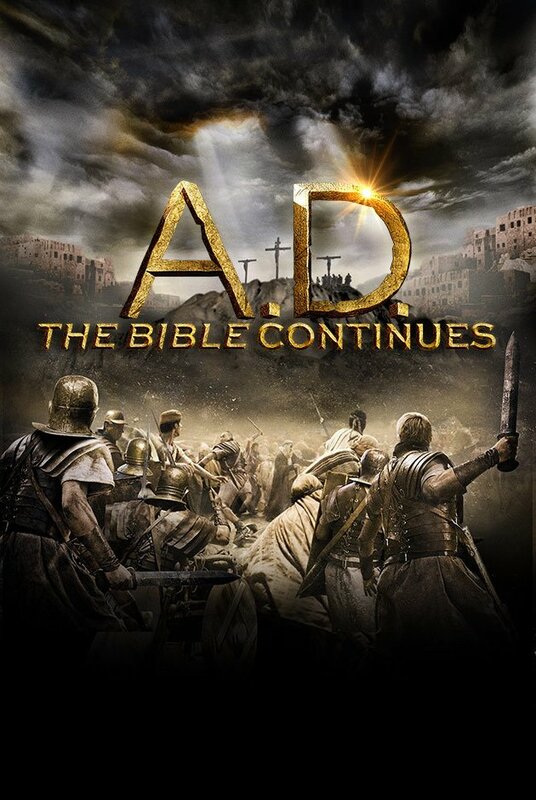 The Bible Continues which premiered Easter Sunday. This series, as you likely know, is a welcomed sequel to The Bible which aired on the History Channel in 2007 with extraordinary ratings. Sherrylee and I did not see the first series as they aired, but we bought the DVD and used them as part of our devotionals for several weeks. The only negative thing that I will say here about A.D. is that it is going to be much better when watched without all the commercial interruptions. It’s pretty difficult to jump from the raw emotions of the crucifixion to car commercials appealing to your most materialistic pleasures. We intend to DVR the program and skip the commercials in the future. The executive producers Mark Burnett and Roma Downey have kept the scripts well within the biblical context, while—and this is their genius—adding the creative imagination to the gaps in Scripture. Of course, the writers take some license with the biblical text, but not so much that most of us who believe are offended as was the case with some recent attempts of Hollywood to appeal to Bible-readers—think Noah (2014), which you may not have even seen. Probably to take advantage of opening on Easter Sunday, this first episode rehearsed the entire Easter Story again. Fortunately in my opinion, while the horrific suffering of crucifixion is not mitigated in any way, the focus is more on the drama surrounding the death of Jesus and the struggle for faith of its witnesses. Joseph of Arimathea must go against his own high priest to bury the body of Jesus in his tomb—because it is the right thing to do. The few disciples who have even found their way back to the others wrestle with whether to wait three days and see if there is really any chance of His return—or not! Even Pilate has to deal with his wife who is convinced by her dreams that Jesus is a good man. But the Burst of Resurrection is the best moment! I love the angels in these two series. They are warriors! We first see this in the two who go to Sodom to test and rescue Lot and his family. The “wings” crossed over their backs are swords with which they fight their way through the wicked city. On Resurrection Sunday the angel, standing in dazzling light, pulls his sword, challenging (unnecessarily) those who guard the tomb. I love the show of strength and power as opposed to wispy, softly-blurred angels. Just as with the angels, the other characters are a little stronger, a little more raw, a little more Middle Eastern than we have often seen—and it makes this production better! I can’t wait to see what they do with Stephen and Paul and Simon Magus and Lydia. In addition to the mini-series itself, NBC and the co-producers are launching what they call a digital talk show called Beyond A.D. , which will be taped with a live audience and will basically be a dialogue between audience participants and some of the cast, the producers, and other special guests. The description says that both historical and spiritual topics will be discussed. Beyond A.D. will launch next Sunday night April 12 and should create wonderful new possibilities for people to explore the Story. It’s true that some are preaching out of jealousy and rivalry. But others preach about Christ with pure motives. . . . Those others do not have pure motives as they preach about Christ. They preach with selfish ambition, not sincerely, . . . But that doesn’t matter. Whether their motives are false or genuine, the message about Christ is being preached either way, so I rejoice. And I will continue to rejoice. (Philippians 1:15ff). 9.5 million people watched A.D. last Sunday. That’s good!